The ability to sustain a seriously long career with one’s performances alone seems to have become a lost art. Any time is a good time to talk about Sivaji Ganesan, but in case you want to peg this piece on an anniversary, Thillana Mohanambal turned 50 last year. Veerapandiya Kattabomman (1959), the film that launched a thousand audition monologues, turns 60 this year. Deiva Magan (1969), in which the actor played three roles, turns 40 this year. Note that each of these landmark films is in a different decade. What about the 1970s? We have another triple role in the blockbuster Thirisoolam, towards the end of that decade. And we come to the theme of this piece, that an actorly actor — someone who was sought out for his performances rather than his “mass appeal”, someone who made dramas rather than “mass” movies — was a huge star across four decades. Yes, I’m cheating a little and including the 1980s, too, which yielded hits like Mudhal Mariyathai. But after seeing the BO of seethakathi recently ..one has to pray that he wouldn’t change his mind anytime in the near future..
Manish Kaarthick: But Vijay Sethupathi is hardly a versatile actor, no? He fits certain roles well but doesn’t really have much range. Very topical piece and spot on about VJS. Sivaji was amongst the greatest Actors ever in terms of pure skill and range. Kamal had his hand in several pies as well apart from Acting but as a pure Actor, Sivaji was pretty much peerless IMO. Also; most of the off-beat, Indie-like gems in Tamil Cinema that are eagerly gobbled up by the ‘discerning’ Junta seem to be driven more by Auteur love. Like the current frazzled Aussie top-order, there is not one standout ‘Actor’ who is ‘breaking down the damned doors’ and screaming ‘look at me’. The issue is Ajith and Vijay are nowhere close to the actors that Rajini and Kamal were. So even while ascending steadily towards stardom, Rajini could attempt something like netrikann or soft actorly roles you talked about. He doesn’t look unconvincing in those roles. If you move Ajith and Vijay from their comfort zone of star dispensing vehicles, I doubt they will be convincing. I am not even talking about versatile acting, but the ability to handle roles out of your comfort zone to some extent. Since these two have become the aspiration stars for up and coming actors, the trend follows, IMO. I don’t entirely agree with the blame on fans for the lack of actor stars. Dhanush does enjoy a reasonable fandom and so does Vijay Sethupathi (some reservations about his range not withstanding). I think we will have to explore the question of whether it is possible any more for a pure thespian to also be a star. Only when this happens does a star have Sivaji like longevity. There really aren’t many actors who can claim to have that kind of longevity. Dilip Kumar also enjoyed a very long career as star, if with long fallows from the 70s onwards. AB too. By the time you get to Rajni, though, you already see the change. Of course Rajni is a good actor but what has sustained his superstardom is a strong identification with his persona that goes well beyond his acting. As late as last year, AB scored a moderate success with 102 Not Out. What sustains this kind of popularity? It is because in AB’s case, him playing his age (or higher, as in 102 NO) has been accepted by the audience. This is a must for stars to have longevity, like the way RDN and Pacino were bankable long after their youth had passed. Pacino was nearly 60 when he played Lowell Bergman in Insider. It worked because that role didn’t require him to look dashing or swoon the audience with incredible charisma (though he was still helluva charismatic as of that role); it did require intense acting. I can kinda of imagine Aamir Khan fitting into some such slot of respectable older star when he gets to that age. SRK has the chops but don’t know where he’ll be at 6-7 years from now if his questionable script selection continues. But in Tamil, there is still no indication that it’s ok for a star to just play somebody middle aged and normal (i.e. NOT capable of getting into kola gandu and beating up a whole gang all by himself). As long as starpower is synonymous with action in Tamil, the shelf life of stars will either be limited or, as you said, dependent on their establishing and maintaining mass following that relates to their persona and not so much their acting. When you look at it, action is a relatively safe bet that way. A good actor like Liam Neeson milked it for all its worth with the Taken franchise so why not not-so-Ilayadhalapathi. Vijay Sethupathi has some kind of raw appeal. Fans get delirious when they see him on screen. Dont think they are drawn only due to his acting. And yes, his range is very limited. Vikram did try to be the mass+class star, with monster hits like Dil Dhool Samy Gemini Anniyan and performance oriented roles like Sethu, Kasi, Pithamagan, Dheiva thirumagal, Raavanan. But sadly somewhere he lost his grasp on the BO. That he took a long time to get a foothold here also went against him. But he had the charm and dynamism of a mass star, plus in certain type of character roles he shone like none other. I remember there was a guy called Babu who debuted in Bharathiraja’s Ennuyir Thozhan – who had the spark as well as acting chops. His was a breakout performance & all the magazines here hailed him as the next big thing in the industry. At that time, our industry was so starved of a good actor, that this boy went on to sign a dozen films even though Ennuyir Thozhan flopped. Sadly he met with a crippling injury during a film shoot and faded away. Oh yeah Navarasa Nayagan Karthik was there – winning 4 filmfares for solid performances in Varusham 16, Kizhakku Vasal etc & He could also be the mass hero as in Agni Natchathiram, Pandi Nattu Thangam, Urimai Geetham etc – but all this just for a brief period of 5-6 years. He couldnt sustain it like a Nadigar Thilagam! And now there is just Dhanush – who has managed to somewhat overcome his disadvantage vis-a-vis his slender frame, in films like Maari, but his physique could still come in the way of him getting certain kind of roles. For eg, can you imagine him or any current star in the Thiruvalayadal fisherman role of Sivaji – where one should have the mannerism of fisherfolk, yet the audience should well be aware that it is the all powerful God himself in disguise. Not even Kamal could have nailed this. 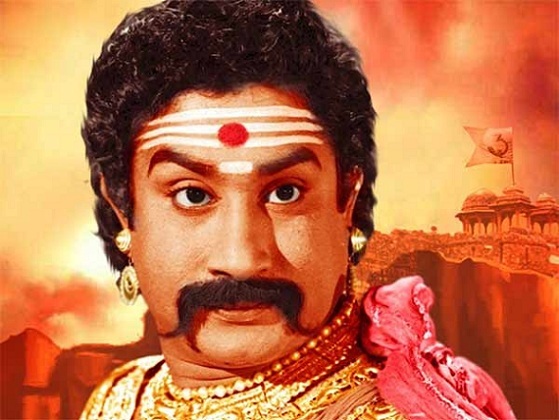 A question for the older generation as getting authentic TamilNadu Box office results is harder than going to moon – Did Sivaji’s offbeat films really work or did he largely sustain his stardom by his family dramas? Having followed Kamal’s career closely, I believe that he has largely survived this long as a top hero because of his stardom/like-ability as a hero and not because he is a great actor. Many of his experimental movies like Guna, Hey Ram, Kurudhi Punal, Aalavandhan were catastrophic failures and he needed very commercial follow-up movies to survive. He also had a tremendous advantage in the fact that he could write and direct very well. So, in the worst case scenario of consecutive flops he could bounce back on his own to an extent. Most of the current stars followed Rajini’s footsteps and not Kamal’s because they have seen enough Kamal’s failures in 90s and 00s that there is no point in pursuing that path. Vijay Sethupathi can be legitimately considered a star only for the past 1-2 years. His previous interesting movies were as a newcomer and then a somewhat popular face. He is either going to go via Vikram/Surya route, do commercial movies and sustain stardom longer or if he sticks with quirky small-budget movies remain in the Tier-2 list of stars. Yes, seems like we are becoming a bit like the Telugu film world where every hero is a mass hero. The out of the box movies are left to relative new comers. It would have been interesting to see Surya balance the mass-class world a bit better. Why did the sivaji fandom wane out in the 80s ? He was only in his 50s. The age difference between Rajini and Ajith is very similar to that between Sivaji and Rajini. Rajini is close to 70 now and jus had a box office clash with Ajith. When sivaji was 70 he was playing Rajinis dad in padayappa !! I can’t even imagine Rajini playing Ajiths dad with a role that ends well within the first half. THere are no star-actors today.. the only 2 who were almost star-actors were Kamal and Rajini till early 80s.Ajith, Vijay,Vikram, Surya, VS, Dhanush neither have the charisma/screen presence required for a star in Rajini mould nor have the acting capabilities of Kamal.Forget Kamal , I don’t think any of them rank anywhere close to Rajini, when it comes to just acting skills. Rajini himself way behind Kamal in his range.Of course Rajini has completely different set of skills. I doubt if there’s any actor who could have pulled of a Netrikann, Thillu Mullu, Mullum malarum etc. In the yesteryears, anyone who made it, made it really big! There were very few people who got the opportunities though in the first place. Very much unlike these days, where just about anyone can become a hero. Anyone can make a movie. Anyone can write a blog (:p), anyone can comment on it (:p). So overall, the longevity of yesteryear stars was much longer than now. Even though Sivaji is considered the “actor” of the Sivaji/MGR dichotomy, he still often had a showy quality, with his fiery dialogues (or monologues), chameleon-like range of roles, and sometimes multiple roles being a way to show off and command the screen. He wasn’t always doing that, but those things are a form of playing to the gallery. But to be truly “massy” an actor has to have a “makkallukku nallathu panren” kind of persona across films, without much variation in the core character, that’s instantly identifiable. What were those circumstances? What was the social situation and film-going climate like that made the lead in a drama like “Parasakthi” a superstar, and what was the climate going forward that sustained the superstardom of such an actor? Perhaps the people today who gravitate towards anti-blockbusters more than the mainstream films follow directors more than they do actors, hence the lack of an anti-blockbuster superstar on par with the mass heroes? Not an issue if you reveal my email id because nowadays actors fans are rowdies or even say as per rajini in cinemas everyone from age of 10, they become villain to other by smiling at others, no one shows real face. Mohanlal and Mammotty both became megastars because of their excellence as actors, not because of their “mass” appeal. Although the quality of their films have heavily fallen, there isn’t a set “Mohanlal film” or “Mammootty film” that people expect. And I’d argue that their stardom has endured due to the goodwill gained from the occasional Thanmathra or Pathemari or Drishyam. People still love them primarily for the incredible actors they are. Also in Malayalam, people like Fahadh Fazil and Prithviraj have reached and sustained stardom based on the quality of their acting. In fact, many people go to see Fahadh Fazil films to see the “Fahadh touch”, his uniqueness as an actor. I absolutely loved Sivaji in Thillana Mohanambal. It was a mature film (mostly) where there heroine had as much scope as the hero. —As much as Kamal (who always had “actor” credentials) is seen as a spiritual successor to Sivaji Ganesan, it’s important to remember that his stardom was cemented by “mass” movies like Sakalakalavallavan. So, denigrating a woman and putting her in her place (according to the hero) in a movie cements a hero’s ‘mass’ movie stardom. I’d add the loosu-ponnu, Tasmac song blaming her, to the Mass Effect after the 90’s. Maybe this wasn’t the meaning in its entirety, but this is how I feel about our Tamizh (including Telugu/Malayalam/Kannada) mass movies. I think it is going to be hard to see someone like Sivaji, with his acting skills, stardom, and longevity. Firstly, he is a great actor, got the opportunities, and he took the opportunities. Sometimes, I felt he made many bad choices, saying YES to directors who relied on tear jerkers, but still it is really surprising he overcame all those to keep acting in father roles in late 90s. His body of work is highly impressive. Along with Karnan and Veerapandiya Kattabomman, we get a Motor Sundaram Pillai and Aalaya Mani. People complain about his over the top acting, but it worked for me, except the manipulative tear jerker dramas. I am still impressed and moved by the emotional burst of Enge Nimmadhi scene from Puthiya Paravai. After Deivame, deivame song in Deivamagan, only other song where I have seen that kind of exhilaration is with Dhanush in Otha sollala from Aadukalam. Bale Pandiya, Galatta Kalyanam, Ooty Varai Uravu, he amazed us with his comic sense. While his star value helped him, he also took risks with challenging roles and stories that did not have mass appeal and actually did not do well in BO too. IMO, first thing our current lot of actors need to do is take the focus away from BO. They are always in their comfort zone, except may be Dhanush and VJS. Assuming they have the acting chops, I am giving the benefit of doubt knowing many don’t have, they have to take risks like Kamal did. Who in our lot is willing to do the role of Jack Nicholson in The Departed? Or Tom Cruise’s role in The Magnolia. I don’t think even Kamal would be ready. For those roles we have to go to Naaser or Nawazuddhin. Who can pull off the role of Sivaji in Mudhal Mariadhai? Sadly the whole eco system, print, online and social media, reviewers (not you BR!! ), has moved towards BO mindset, making it hard. It has become a binary, hit or miss. Yes, we need to have mass movies similar to Hollywood blockbusters. But similar to Hollywood, we need a market and recognition for movies like There will be blood, Magnolia, The Master in Tamil. Else we will never get to see another Sivaji. Malayalam seems to be faring better in this, with movies like Maheshinde Prathikaram, Sudani from Nigeria, Angamalay diaries, Thondimudhalum Drikhsakshiyum getting good reception and recognition. Still less numbers in my opinion. We have another triple role in the blockbuster Thirisoolam, towards the end of that decade. And we come to the theme of this piece, that an actorly actor — someone who was sought out for his performances rather than his “mass appeal”, someone who made dramas rather than “mass” movies — was a huge star across four decades. I respectfully disagree BR. First of all, A great performance is half decided during the writing itself. A great actor understands this and completes the puzzle the writer envisioned. A great Actor like Nawazzudin Siddique can be wasted through bad writing as in Petta. Next comes the TMS. Gauravam, Personally my best pick for Sivaji’s Towering performance is at its core a “Great masala movie” with a heart-wrenching father and son sentiment and a great moral story. Part of Sivaji’s Appeal should be credited to TMS towering voice that expressed those emotions, Kannadasan Lyrics and MSV/KV Mahadevan music. “Naan Asaindal Asaiyum Agilemelame” is timeless not because of Sivaji’s great performance alone but the vision of AP Nagarajan, The titanic voice of TMS, Kannadasans lyrics and KV Mahadevan’s music. This does not mean to take away any greatness from Sivaji. The point is Sivaji “The actor” Empowered the Writers, the singer, and the lyricist and Pretty much Sivaji supercharged these people to achieve the best because he gave them infinite windows of possibilities that these people cannot see with other actors. This perfect MUTUAL symbiosis is what attracted the audience. Now coming back to the current age, Please look What Virkams has done in I. Vikram gave one of the best performances ever, a kind of performance that would have dethroned Kamal but the writing was so bad, so boring and so amateurish that all 3 years of hard work is gone. Although I want to watch Vikram’s performance, the idea of watching a boring and amateurish movie keeps me away. Bottom line, I would not blame this on the audience or even the current circumstances. Anjaan and Singam series from Surya still gives me nightmares. And what a massy crowd-pleasing performance by Dhanush in Maari 2 rite? Please tell me how many quality writers/Directors that Surya, Vikram worked within the past 10 years? Tell me one example where such a movie failed. Answer Zero. (with the rare exception of 24 that still performed well at the box office and All Vetrimaaran – Dhanush Combinations were Blockbusters)). The blame should be squarely rested on laziness and broader ambition of these star Actors and the writers/directors who work with them. Rather than going with the trend or judging what people wanted or targeting that shiny Post somewhere in future, These star actors should shed their False understanding of so-called entertainment(in your own words from Aandavan kattalai review “Entertainment that is about something, that says something”) and try to find that holy grail by working with Excellent writers, directors that they can excite and who in turn can provide broader canvas for these stars to shine. What’s missing is not the crowd’s appetite but a mutual symbiosis of star actors and great writers. Whoever does it will be celebrated more than Sivaji was celebrated. I am with MANK here. IMO Sivaji started playing to the gallery much early in his career, a fact often overlooked while analyzing his career. I would say he cruised the first phase of career not through acting (although there was an ‘Andha Naal’ here or ‘Ethir Paararadhu’ there). It’s just that reciting those long dialogues (in a theatrical rhetoric) was the mode of popular acting during that era. @Sifter I would disagree in that action films like Kaaki Chattai or romance like any number of Mike Mohan films were also blockbusters in the 80s. Comedies too for that matter. Like in both Bollywood and Hollywood, there now seems to be a ceiling on the level of success you can have with these genres. You could come up with a $ 200-300 mn success with a romance or drama (eg Star Is Born) but the billion dollar club seems to be dominated by superhero franchises. In the absence of that, yes this misogyny laden trope is reprised in Tamil cinema to achieve mass success. That said, Petta was fairly progressive by Rajni standards but KS may have rightly calculated that the misogyny wasn’t particularly necessary with the kind of enduring appeal Rajni enjoys. MANK – “Fahadh fazil is the actor who survive purely with his talent, without doing those massy roles. He has his limitations, but he always chooses his roles wisely” – probably his Velaikkaran was an aberration? I watched it only because he was there, and felt disappointed. Mr Rangan, Many of Kamal’s biggest hits in 70s to 80s are based on acting skills in Apoorva sagodarargal, Marocharitra, Manmatha leelai, kalyana raman, 16 Vayathinile, Sigappu rojakkal, Moondram pirai, Salangai oli(not just andhra, dubbed version ran in other south states), Sippikul muthu(dubbed version also a hit)..In the same 80s period Kamal ‘s classic films were accepted aa much as mass films like sakalakala vallavan, Thoongadhe thambi thoongadhe, Vikram, Kaaki Sattai.. Rajini mass films were successful but his Raghavendra, Engeyo ketta kural, Un kannil neer vazhinthal flopped .. When you talk about Kamal you pretty much sound like an emotional Bharathiraaja (as in when he talks about his own films) – that Kamal is an art-film material. When you look at some of the recent interviews of Kamal, it’s amply clear that during the 70s and 80s he sought to establish himself as a star who could also act. BTW, you might have to do away with this bit: “Note that each of these landmark films is in a different decade”. I haven’t seen much of Sivaji except in devar magan and padayappa both of which had fantastic performances by him. But, I feel there are plenty of star-actors today too. Ranveer Singh, Vijay Devarakonda (though only few films old, I feel he has it in him to do various other roles), Dhanush, etc. Obviously, they can’t attain Sivaji levels of Patti thotti popularity, because the bar for entry to cinema had become very low as Jaga Jaga pointed out. Hell, udhayanidhi Stalin is an actor. The string of discussions can in no way discount the prowess demonstrated by Nadigar Thilagam in his unparalleled career. Attempts to draw similarities forcefully will just fade away if one starts analysing the individual threads. Even in times like Mudhalmariadai when interacting and not dialogue delivery was the paradigm he was superb. Those who enjoyed and still enjoy the subtle nuances in his MasterCard will simply laugh at this discussion comparing the Great with tiny elements. On father-son duo both acting as mass heroes, Telugu films have been able to do that. Nagarjuna and his son are both acting mass roles the last few years (though must say his son is more a softie compared to his star dad), Chiranjeevi acted in a mass film even after his son Ramcharan had established himself as a star with his films like Magadheera and Racha. Balakrishna became a star even while NTR was still prancing with the likes of Sridevi and Jayaprada. I thought there was some overlap between Nageswara Rao and Nagarjuna but Nageswara Rao was always a more serious actor….and does not qualify in this context. The great Morgan Freeman once said …..” if you become a star , people are going to go to see YOU at the movies and if you remain an ACTOR , they go to see the STORY you are in “. If only he hadnt dabbled in politics, his last phase in films would have seen much better roles. I know female actors don’t headline many movies, but lady superstar does seem to have put a crack in the glass ceiling there. Do you think there’s a chance that female actors can achieve such stardom, or does same actor/star distinction apply?